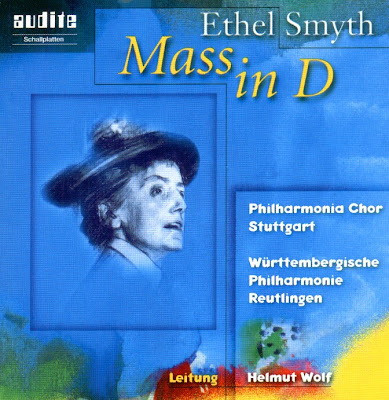 Ethel Smyth was born in 1858. Being a child of the Victorian age she received a strict education at home and at a boarding school against which she revolted again and again. She studied in Leipzig - strength of will and persistence were her strongest characteristics. She composed chamber- and piano music. A serenade for orchestra was her first success in England. The Mass remained her only religious work. In 1910 she was active in the English suffragette Movement which fought for woman's right to vote. She then composed the "March of the Woman", she took part in activities and demonstrations and was arrested. More and more often she conducted her compositions and her reputation as a composer increased. In 1922 she was ennobled "Dame of the Empire". In spite of advancing deafness her spirit remained unbroken, writing and journalism were added to her composatory work. Reaching the age 0f 85 she died in 1944. In January 1893 the première was held with about 1000 performers in the enormous Albert Hall in front of an audience of 12000 people. It was reveiced with enthusiasm. The "Gloria" was performed as festive finale at the end of the Mass being the composer's utmost wish. In spite of this great masterpiece the work vanished from sight to reappear again 30 years later. For a re-performance in 1924 the work was revised by her. The changes refer to a small improvement in the choir- and orchestral parts and a reduction of the metronome beat most considerably in the fast movements. The changes are surely due to the remembrance of the première with its gigantic number of performers. "Dear Dame Ethel, - Thank you for bullying me into going to hear that Mass. The originality and beauty of the voice parts are as striking today as they were 30 years ago, and the rest will stand up in the biggest company. Magnificent ! You are totally and diametrically wrong in imagining that you have suffered from a prejudice against feminine music. On the contrary you have been almost extinguished by the dread of masculine music. It was your music that cured me for ever of the old delusion that momen could not do men's work in art and other things. (That was years ago, when I knew nothing about you, and heard an overture - The Wreckers or something - in which you kicked a big orchestra all around the platform.) But for you I might not have been able to tackle St. Joan, who has floored in every way playwright. Your music is more masculine than Haendel's ... Your dear big brother, G. Bernard Shaw". The CD was released by AUDITE, 1997, (DDD). Audite 97.448.